vehicles in underground mine tunnels. This type of battery features excellent advantages of vibration resistant, optimal self-discharge, long service life and easy installations. 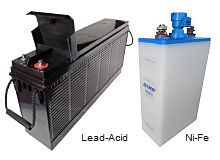 Traction battery (Lead-Acid type), in its real sense of designation, features far more outstanding characteristics that conventional batteries can cope with, when used in D.C. power source for conveyor cars and vehicles in underground mine tunnels, thus we claim it to be explosion-proof technology, e.g. * Battery plates: Tubular positive, pasted negative and protective highly intensive separators. * Battery terminals, plugs and plastic container or covers must absolutely be either of least internal resistance as conductor, acid-resistant, highly insulating, flame retardant and impact resistant when adopted in power source unit. Noted that we would recommend our lithium batteries mainly for traction purpose (Not for professional EV’s!) based on lithium technology not even 80% mature to date. We have more promising work to do and investigate into in the field of EV battery technology, though. To catch up with world trend in the industry for energy-saving, energy recycling, environment protection and sustainable development, Q-Lite has been keeping on exploring for possible solutions for traction applications over the past years, in order to sort out a reasonable and reliable scheme to launch EV energy replacements in the future.